The bitterness of Ganoderma Lucidum comes from the triterpenoids. The triterpenoids are fat-soluble small molecules. Such molecules can usually enter the cells of the human body to perform tasks. It is very different from the macromolecules of Ganoderma lucidum polysaccharides. Our body organs are made up of cells. These cells originate from a fertilized egg that combines sperm and an egg. During the development of the embryo, the fertilized egg develops from a cell into a complete individual. The individual contains heart, lung, liver, skin, eyes, ears, mouth and other organs. All organs are from the same cell and therefore have the same genetic code - DNA. Each person's characteristics is passed on from generation to generation through the codes of DNA. This set of codes also directs cells to create tens of thousands of proteins to perform various tasks to maintain normal cell growth and physiological stability. There are many proteins that play the role of a messenger in the cell, and the division of labor and cooperation also contain each other to form a complex information transmission network. In the case of cancer, scientists have discovered that mutations in DNA cause cells to malignantly proliferate without the body's control. In recent years, it has been found that the mutation of DNA further causes the protein to be deficient, excessive or loses the ability to contain each other, leading to the imbalance of the information transmission network, which is the main cause of many cancers, and the use of drugs to correct these information transmissions can make cancer cells develop to a normal state. In addition to causing cancer, because the abnormality of protein transmitters can cause other diseases, the use of ganoderma small molecule drugs to enter the cells to regulate the function of proteins can also correct other diseases, which makes the development of small molecule drugs become very popular in the scientific community. Due to the unremitting efforts of scientists in the biomedical field and the advances in molecular biology, the causes of disease are becoming more and more clear, so the treatment of diseases has a new strategy called "targeted therapy." Many studies have found that small molecule drugs can target the information transmission network of cells, and some target treatments have been successfully used clinically. Small molecule drugs target the protein messenger, correcting the path of the network by regulating his ability to transmit signals, and returning the cells to normal function to cure the disease. Under the efforts of natural chemical chemists for two or three decades, nearly 200 species of Ganoderma lucidum have been isolated and identified, and more than a dozen of them have been proven to have valuable pharmacological effects. Since the history of Asian people taking Reishi Mushroom as a health supplement and a cure for medicine for thousands of years, we believe that the ingredients in Ganoderma lucidum have biochemical activity. 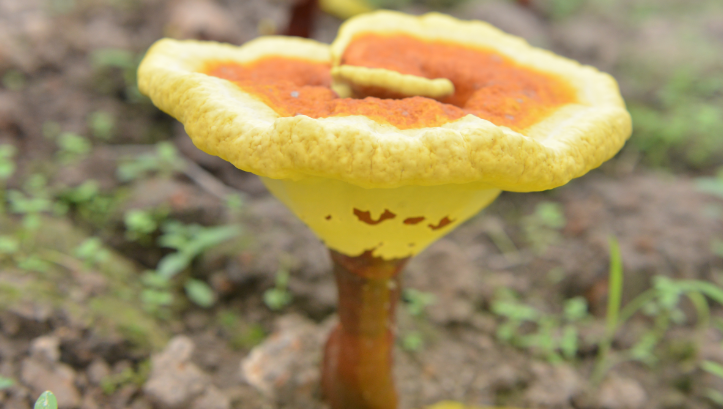 However, the basis for supporting the efficacy of Ganoderma lucidum can not only be based on the history of widespread consumption but should be verified by the current biomedical knowledge and design of different experimental systems, so that the efficacy of Ganoderma lucidum diversity is supported by scientific evidence. Since the types and contents of triterpenoids contained in different Ganoderma lucidum lines are different, it is also important to carefully select the variety and source as a healthy food.